If you are not technologically savvy, you may be consistently confused with the technological jargon that is most common in today’s societies. Every day there are advancements in how people are able to run their businesses and their personal lives, all at the touch of a screen. The technological revolution has been a whimsical, thrilling ride in which every day there is a new addition or feature. You may have heard of the infamous “cloud, ” and how you are behind the times if you aren’t “on it.” Cloud computing is when you store and manage personal or business information online instead of keeping it all on your phone or computer. As you can imagine, there are concerns that many individuals have with storing their personal data online, and rightfully so in some instances. 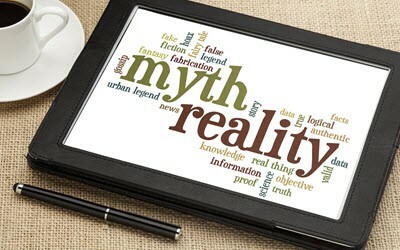 However, there are many myths about cloud computing that simply are not true; learning about these myths and why they are incorrect can help ease your mind about joining the rest of society on “the cloud.” There are differences in security issues when it comes to using cloud computing for business or personal, and when it comes to business, security should always be a top priority and concern. One common myth associated with cloud computing is that it is less secure than backing all of your information up on external hard drives. Cloud computing is a matter of convenience, not always a matter of safety. With that being said, cloud computing has proven to be remarkably secure to-date. While this is still a relatively new development, cloud services are usually not the source of data breaches—in fact, there have been more instances of data breaches where information is kept on hard drives than on cloud services. Cloud service teams have experts on staff whose job it is to ensure the safety and security of the service. Until there is a reason to doubt the security of such services, then be mindful that the potential is there, but do not allow that to restrict your use of cloud services that could potentially offer significant benefit to your company. Another myth associated with cloud computing is that it is all about saving money, and that is the primary purpose of use for business owners. While cloud can save business owners a significant amount of money in resources, it is not always the case. Furthermore, there are other huge benefits of cloud computing that should not go overlooked. Cloud computing offers businesses a more streamlined ease of access to information and technological updates. Additionally, when you have a team of people managing your services, it is helpful to have information accessible to them on a cloud basis to increase the efficiency of processing data. Another “cloud” misconception is that the cloud is “where it’s at” and if you’re not on it, you may as well be dead to the world. While the cloud has become a huge breakthrough in data storage and management, it may not be your cup of tea—and that is just fine. There are other viable and useful ways to manage and store data and files that do not include a cloud service. Since technology is rapidly advancing daily, tomorrow there may be a new service that out-performs the cloud. Whether or not you choose to use cloud computing as a primary management tool is completely based upon your unique, individual circumstances. Every business is different, and furthermore, every business needs something different to succeed—the cloud is not always a one-size-fits-all model, and only you can determine what is best for your company.